Another day means another chance to eat well, and this time we’re doing spicy. 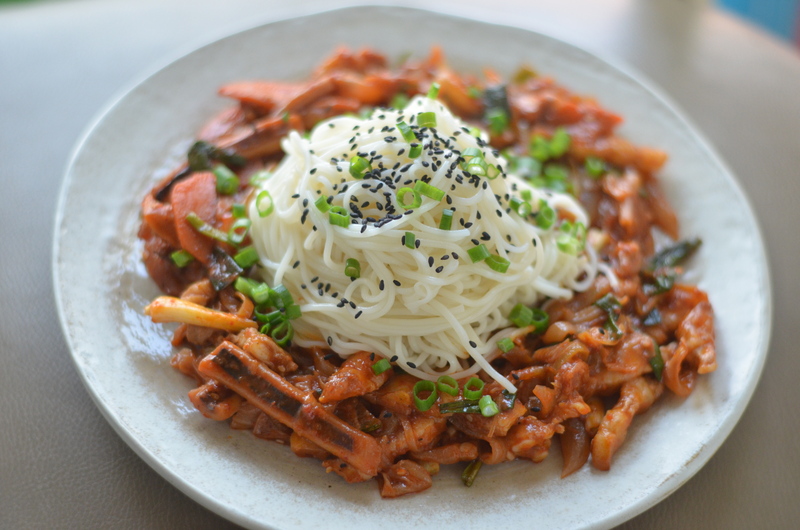 My partner and I haven’t had anything spicy of late (specifically the sweat-inducing kind), so I decided to make one of my favorite stir fried dishes: ojingeo bokkeum (aka spicy stir fried squid). 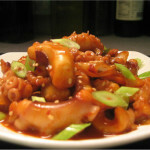 This is a great dish combining squid and a few simple vegetables in a flavorful, sweet n spicy red pepper sauce. 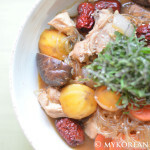 Even better, this recipe is fairly easy to make and not at all time-consuming, although a little spicy for those unaccustomed to Korean food. 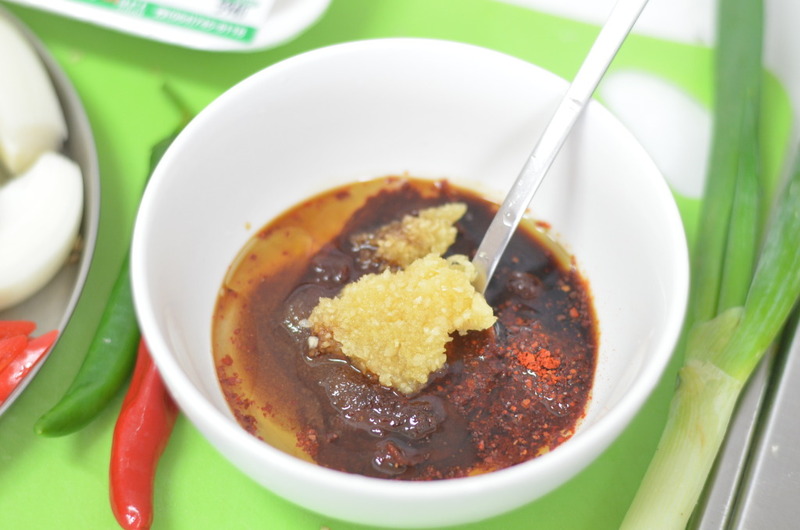 With the added chili peppers and base sauce ingredients of gochujang and gochugaru (red pepper paste and flakes, respectively), you will most likely need a few cups of water (or milk) at your disposal. 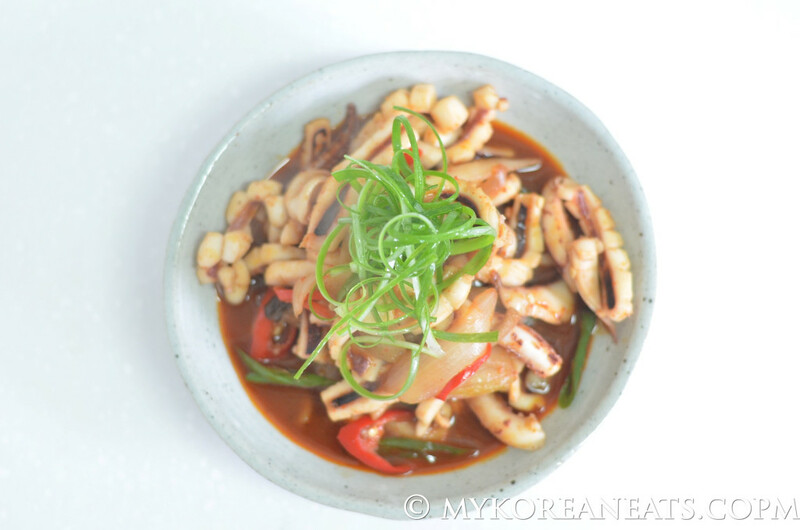 Unlike my last attempt at making this dish a few years ago in the States, it was much easier and cheaper this time around with the availability of fresh, inexpensive squid and other local ingredients. From what I remember, I paid twice as much for a single piece of frozen squid that ultimately tasted like rubber and barely edible. 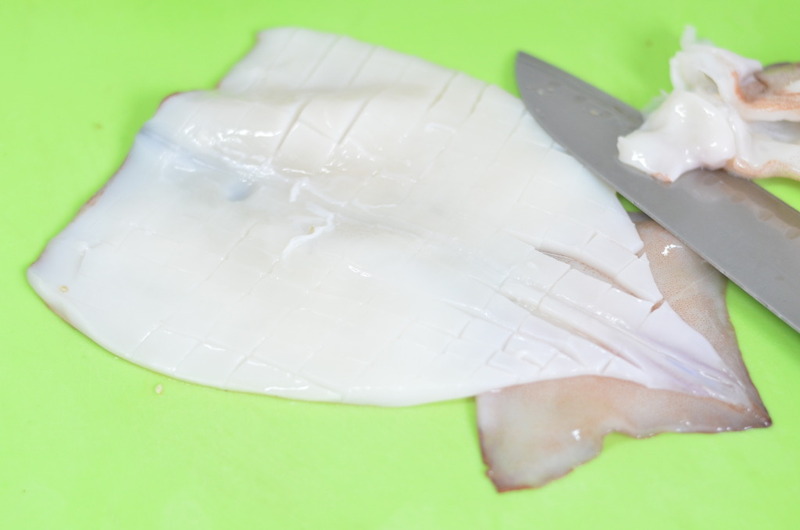 Fortunately, I had no problem this time as I had cleaned and degutted squid all ready to go, leaving me the easy task of slicing them into bite-size pieces. All the vegetables prepped and ready to go. The standard recipe calls for carrots, but I replaced them with something even better….oyster mushrooms. 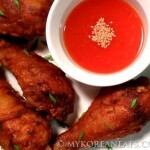 Plenty of gochujang (red pepper paste) and gochugaru (red pepper flakes) for this spicy dish. I added some red n green chili peppers for some extra heat. Slightly score the squid in cross sections. In addition to making it aesthetically appealing, it helps to absorb the awesome sauce. 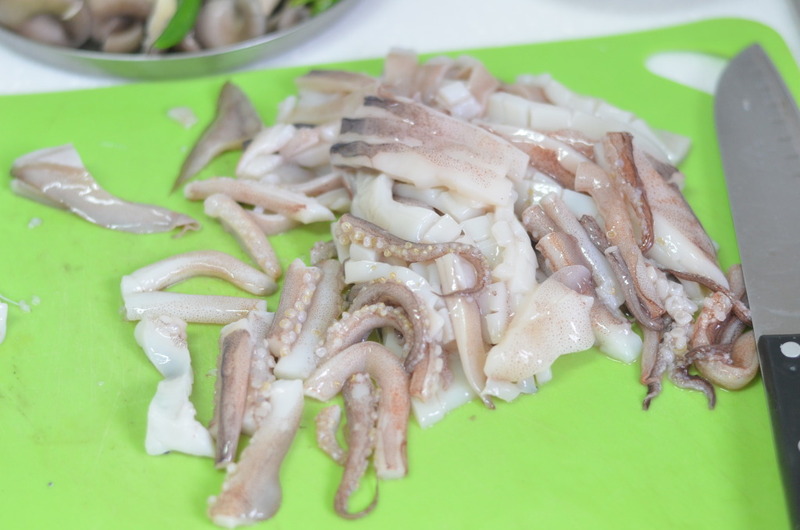 Cut up the squid and tentacles into 2-inch pieces and get ready to stir fry. 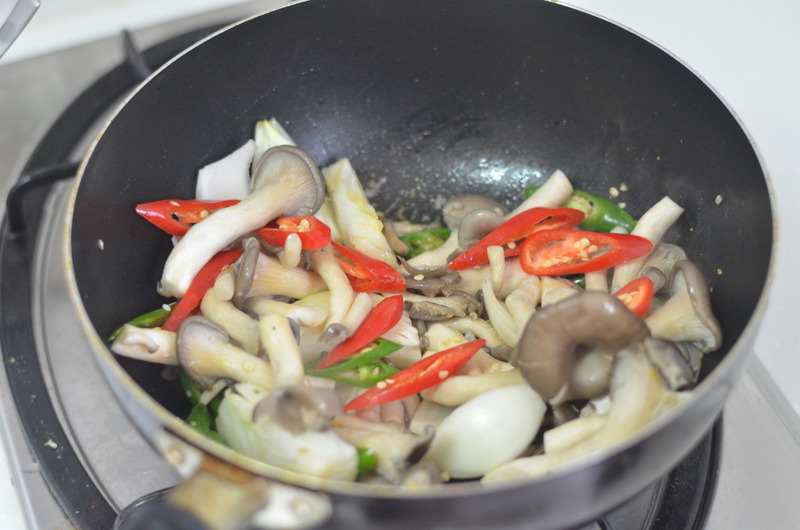 With some olive oil, stir fry the vegetables over high heat. 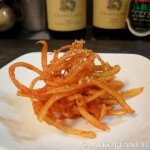 Cook for a few minutes or until vegetables become slightly wilted. 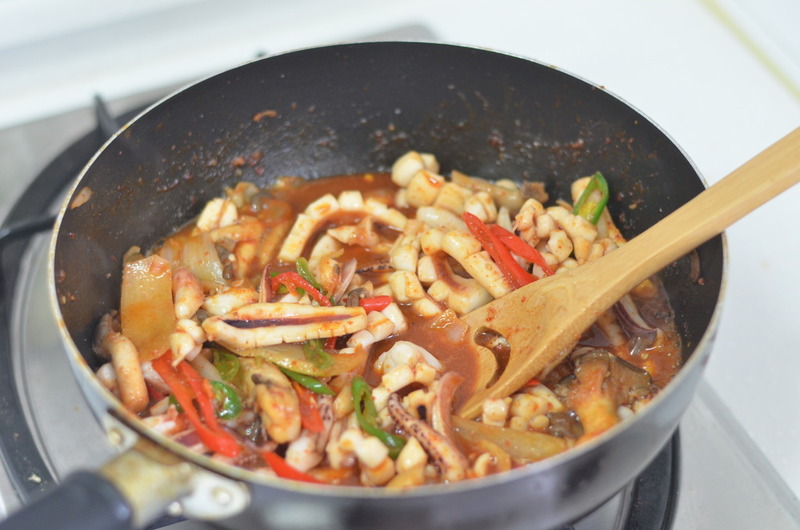 Add in the squid and sauce, stir fry another few minutes. Tip: if you have time to marinade the squid and sauce together overnight (or even a few hours), do it! 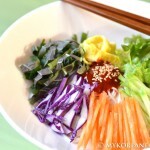 The flavors and texture will be more pronounced, making it ideal with a bowl of white rice. Another one from the food library. Wash squid thoroughly under cold water. Lightly score the flesh in a cross-section pattern. Then cut the squid into approx. 2-inch bite size pieces. Do the same with the tentacles. 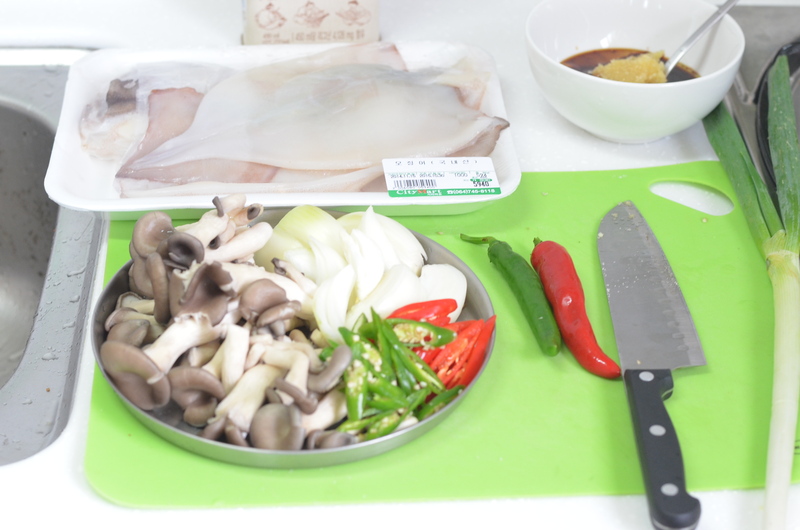 Cut the vegetables into similar sized pieces as the squid, set aside. 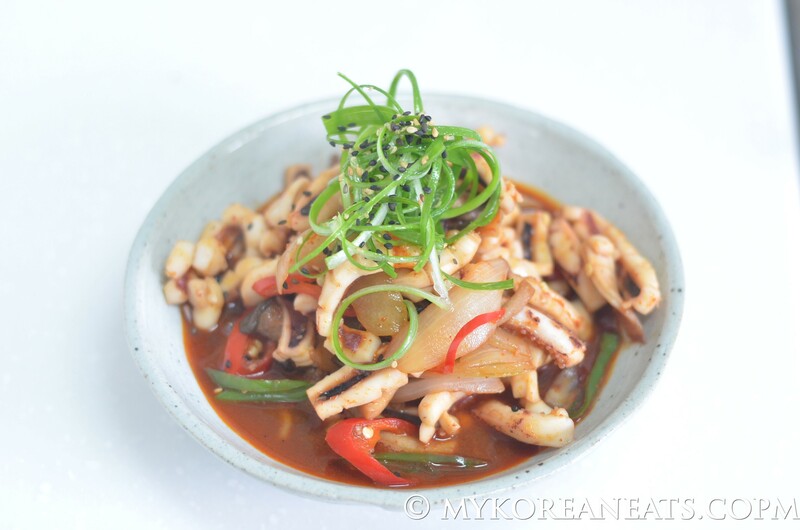 Optional step: After combining the sauce ingredients in a mixing bowl, add in the squid and vegetables and coat thoroughly with sauce. Cover with plastic wrap and marinate for about an hour in the refrigerator. In a non-stick pan, add some olive oil over high heat. Stir fry the vegetables for a few minutes or until slightly wilted. 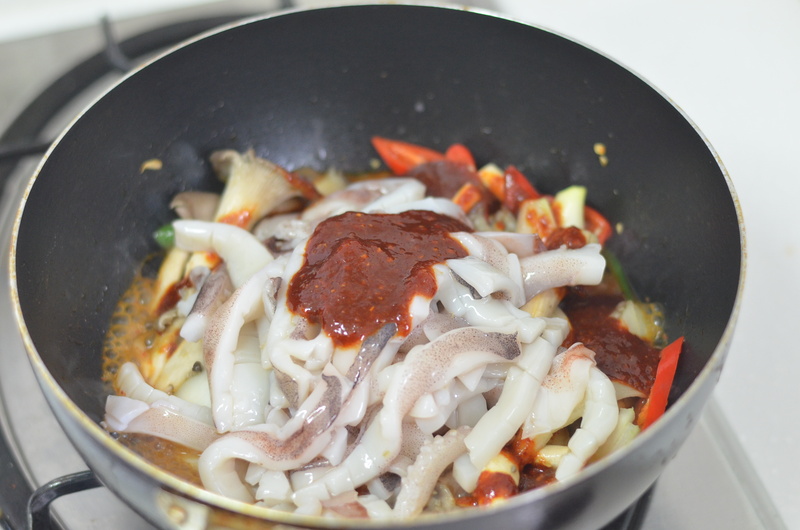 Then add the squid and sauce, stir fry another few minutes. Squid will cook rather quickly. Adding extra water is optional if you like extra sauce.